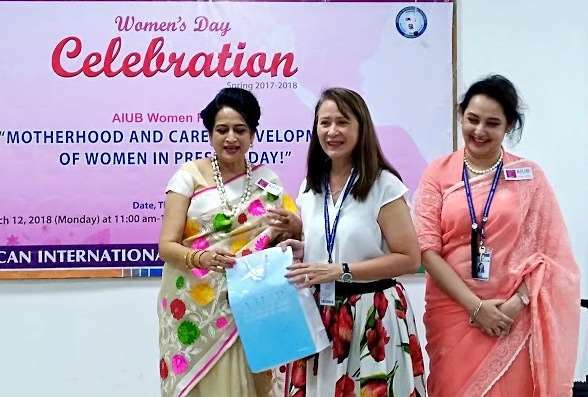 To commemorate International Women’s Day this year, AIUB women forum had organized an event centered on the theme of “Motherhood and Career Development of Women in Present Day”. The program was held on 12th March at the University’s permanent campus, emceed by Ms. Kishwar M Chowdhury, lecturer, Department of Management and HRM. Dr. Siddique Hossain, Dean of the Faculty of Engineering, AIUB, inaugurated the event with an informational speech on the importance of education in women empowerment, stressing especially on the need to integrate female students into the mainstream coeducational system rather than isolating them through the establishment of exclusive girls’ schools. Honorable Vice Chancellor, Dr. Carmen C. Lamagna applauded the initiative to celebrate, honor and inspire our female faculty, students and staff through such an informative and solicitous program. She also delivered the vote of thanks to all the speakers and presented the chief guest with a gift pack of AIUB memento. Several faculty members, Deans and Directors from various departments attended the event, making it a successful endeavor to commemorate the special day.